Recent Paper Shed’s Light on Effect of Using Antibiotics While Traveling – microBEnet: the microbiology of the Built Environment network. When I jetted off to South America a year and a half ago, my doctor sent me with a bottle of Ciprofloxacin in case of an unfortunate bout of food poisoning. I thought little of it then, but what does it mean when millions of travelers head to developing countries with antibiotics? You guessed it – an increase of antibiotic resistant bacteria. This study published in January was designed to identify risk factors for contracting antibiotic resistant gut microbes. The study used the presence of extended-spectrum beta-lactamase—producing Enterobacteriaceae (ESBL-PE) as a measure of antibiotic resistance in the stool samples the collected from travelers. Obviously geographical region is an critical factor in one’s risk for contracting gut resistant gut microbes, but the take-home point is obvious…don’t take antibiotics unless you absolutely have to. 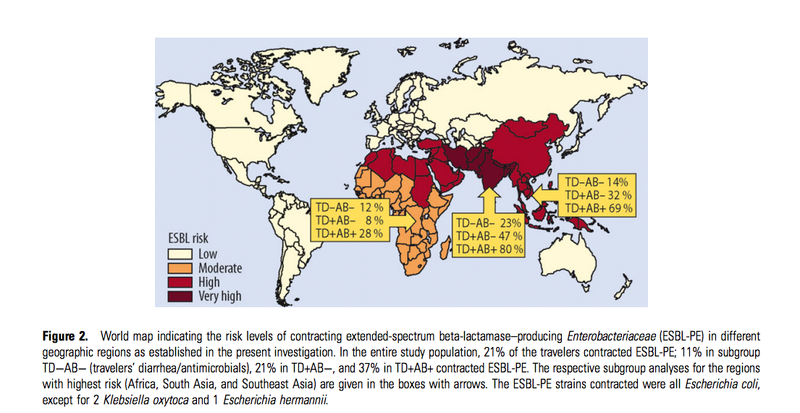 Travelers to high-risk regions who didn’t get TD nor take antibiotics still went home with an increase in antibiotic-resistant gut microbes. In our hyper-connected world we may unknowingly shuttle antibiotic resistance around the globe. This decreases the effectiveness of our current antibiotics on a global scale and will only make it harder to combat bacterial epidemics in the future.